After 15 years in corporate America, Lisa left a secure job as managing director of an international behavioral acience firm to pursue the dream of owning her own business. In 2000, A Novel Idea, LLC (A.N.I.) was founded and began operating its first Auntie Anne’s Pretzels at North Star Mall. Lisa traded her pumps for pretzel proprietorship and worked 70 hour weeks for years, learning the business from the ground up. That hands-on training allowed the business to grow from one store employing eight individuals to seven locations employing 80 people. Lisa was introduced to pretzels by her neighbor – who just so happened to be “Auntie” Anne Beiler herself. 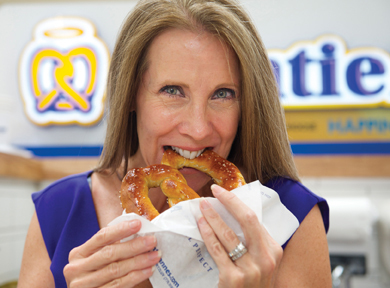 Lisa quickly learned about Anne’s passionate work ethic, worldview, and intriguing success as a pretzel franchiser. She was most impressed by their high regard for people, knowing the correlation between happy employees and positive production. Lisa and her husband have created a purposeful culture with charitable partners in San Antonio, which include Clubhouse San Antonio, Alex’s Lemonade, the USO and Operation Gratitude.